Our chapter is located in central Kentucky's Wilderness Trace counties of Boyle, Mercer, Garrard and Lincoln (Wilderness Trace is a historic name for this part of Kentucky). We're concerned with sustainable energy issues – promoting local solar projects and addressing problems from the neighboring coal-burning power plant and slurry pond; Fairness – ensuring people can live in our community free from legal discrimination; affordable housing – making sure the people in these areas have good places to live; and economic justice in general – helping people have a voice and way to speak out. We welcome all who want to be part of our growing group. Our monthly meetings are a great space to engage with other members and learn what we are currently working on. 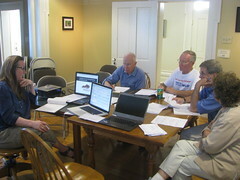 Our newest chapter based in Boyle County hit the ground running just one day after becoming a chapter by holding a voter registration training and planning three days of registration next week at BCTC in Danville. Monday, Tuesday and Wednesday of next week between 9 a.m. and 7 p.m. during each class change period, members will register students to vote. Wilderness Trace: Happy to be KFTC's newest chapter! A group of us have been meeting in the Danville area for almost a year now to discuss environmental and other local issues. Although we considered ourselves to be affiliated with KFTC we had not taken the step of applying to KFTC for status as an actual active chapter until Monday night, September 3. We are proud to announce that we are now officially a bona fide KFTC chapter (the "Wilderness Trace Chapter") with members in Boyle, Garrard, Lincoln and Mercer counties. Earlier this month, 19 KFTC members and friends came together to celebrate KFTC's 30th year of action for justice with a film showing, brainstorming session and birthday cake. 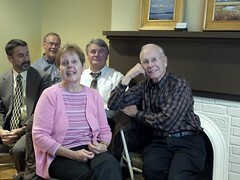 Members of all ages had a part of the fun and fellowship. The evening started with a viewing of KFTC's new film I Was There: The First 30 Years of KFTC. Member J.P. Brantley said the movie was "like a revival meeting." Folks enjoyed pointing out each other in footage from I Love Mountains days and reflecting on the work and the stories of leaders from throughout the decades. 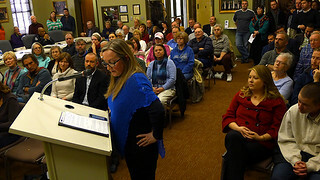 KFTC member Nick Lacy took this photo of fellow member Lee Ann Paynter at a hearing on Fairness in Danville in early 2014. Our regular chapter meeting is on the first Monday of the month and starts at 7:00 p.m. All are welcome. Kentuckians want clean and affordable energy and good local jobs.